If you would like to read the news from one of the stores in our group, please use the navigation on the left. We are happy to announce that we are now stocking Goodridge brakeline kits! 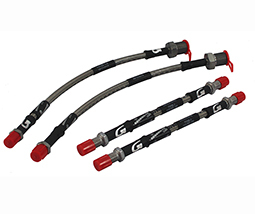 Goodridge stainless steel brake line kits are available to suit a wide variety of cars. The kits feature the finest quality hose, consisting of a PTFE inner with a stainless steel outerbraid. This eliminates the spongy feel under arduous conditions, giving greater braking efficiency as well as providing superior resistance to abrasion and corrosion.